Malicious Apps steal our data, of course, but trusted apps use to exfiltrate some personal and sensitive information from our devices, too. At the ISWAT LAB, the CyberSecurity Laboratory of the Department of Engineering of the University of Sannio, carried out an analysis on 1,000 very popular trusted apps, and 4,593 malware apps gathered from the Drebin project’s dataset, and 672 samples of ransomware, taken from here . All the trusted apps were verified with VIRUSTOTAL . getLac: it returns the Location Area Code (LAC). SMS: SMSs are used by malware to send messages to premium rate numbers without the user’s involvement. Malware also captures the user’s banking information such as account number and password. Malware uses also SMSs in order to communicate with C&C server and/or to send SMSs with the malicious links to propagate the infection. 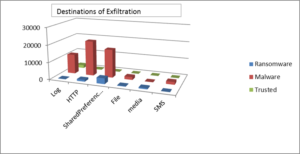 In the following figure we report the overall occurrences of the exfiltration methods for the three classes of analyzed apps (ransomware, malware, and trusted). Ransomware mainly extracts the DeviceID and the phone number, and in fewer cases information about the geographical location of the device. The other kinds of malware exfiltrate mainly the DeviceID, the identifier of the subscriber, the SIM Serial Number, and the phone number. A smaller number of occurrences regard the exfiltration of information about the geographical location of the device. Notice that both the ransomware and the malware aims at obtain personal identifiable information from the data exfiltration. It is interesting that the trusted apps use to obtain sensitive information from the device, too, which is: the DeviceId, and the geographical location, which is enough to track physically the device. 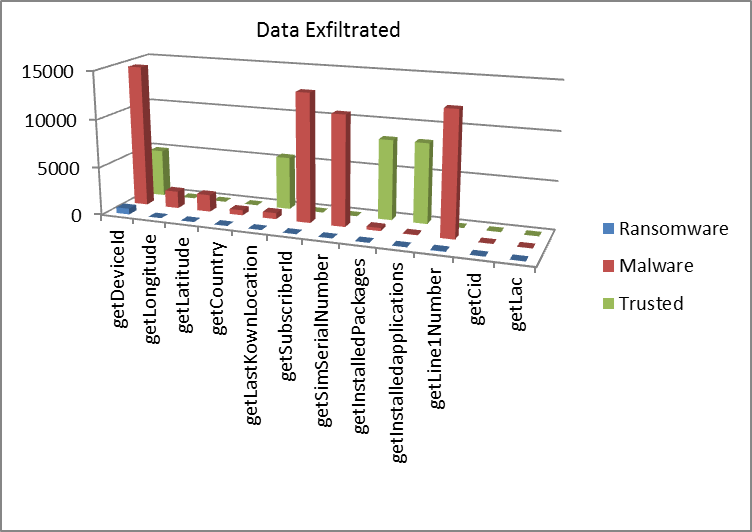 In the following figure we report the overall occurrences of the exfiltration channels for the three classes of analyzed apps (ransomware, malware, and trusted). The favorite exfiltration channels for the ransomware and malware are HTTP, and SharedPreferenced, while SMS are scarcely used in ransomware, but are pretty common among malware. 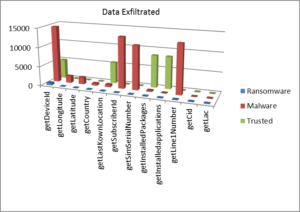 Trusted apps tend to use mainly the Log instruments to record exfiltrated data, while as second preferred channel we found the HTTP; they make a very light use of SharedPreferences and File. Trusted apps do not make use of SMS. The details of this study can be found in “Data Leakage in Mobile Malware: the what, the why and the how.”, published as chapter in the book “Intrusion Detection and Prevention for Mobile Ecosystems” (Taylor and Francis publisher), edited by George Kambourakis, Asaf Shabtai, Konstantinos Kolias, and Dimitrios Damopoulos. The authors of this book chapter are: Aaron Visaggio, Gerardo Canfora, Francesco Mercaldo, and Gigi Gentile.